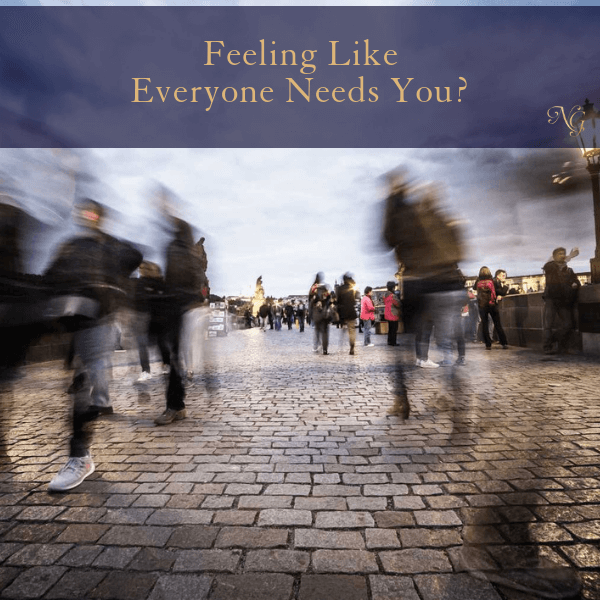 Feeling Like Everyone Needs You? I see and hear from entrepreneurs daily that they are too overwhelmed to make progress. They convince themselves that their overwhelm or “busy-ness” is WHY they can’t make a true decision to do anything differently. That this is “just their life” right now and it is out of their control. 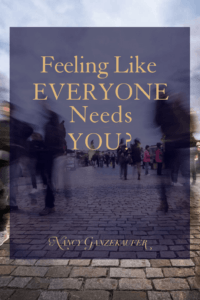 Do you get stuck in your head with overwhelm over how EVERYONE needs you and there is nothing you can do about it? Being in a big push or a huge transition with work or life is stressful but convincing yourself that you have no time, can’t make progress (even small baby steps), and just can’t say NO to certain people is just crap 98% of the time. Being needed or being the ONLY PERSON that can do something is a DECISION you make. I remember when I was working at the Dime Savings Bank of NY over 32 years ago. I was an Assistant Supervisor in the Collections Department and one of the older, more experienced Supervisors, Pat, told me I had better stop teaching my senior collectors how to do my job or I’d push myself right out of a position. I was so shocked that she said that. She was the type of leader that kept everyone in their role and she was “the supervisor”. I was the complete opposite – I taught others everything they were capable of learning, including how to do my job. Meanwhile – I continued to learn, make connections and move UP. When I left that job 10 years later, at 29 years old, I was a First VP and Pat, my old supervisor, was still a supervisor. I had surpassed her by multiple levels. The reason why I share this this story is to teach you that you are not the only one who can do what you do. Consider the fact that if you start delegating, you both free yourself up to work on more important business-building activities and release yourself from staying locked in your bubble forever. This applies to being a parent also! Think about it. You teach your kids skills that will get them to the point where they should eventually not NEED you. You hope that they WANT to spend time with you and share their life, and you certainly want to help here and there, but NEED YOU? No. That would be a strain and you wouldn’t be able to move on to new stages in your own life. Do you want to change? Do you want to follow through with your decisions? Are you stuck in the mindset of I can’t? Does everyone need you and it’s just your life circumstance that holds you back? 1. Take a break from the rat race you got yourself into. Go see a MOVIE, go for a walk, take a Yoga class or make a breakfast date with a good supportive friend. When you are working so hard, it’s ok to slow it down and rejuvenate. You are really not going to MISS anything and this break may help you see things more clearly. It will help you think outside the box and come up with solutions to what you previously thought were impossible situations. 2. Ask for help or hire help and actually let them do it! Give up control. This may actually give someone else the ability to shine in a new role and you the ability to move forward. 3. 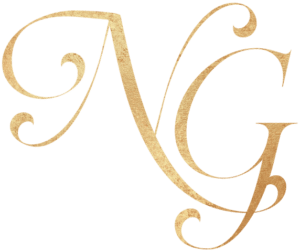 Stop going to every event, party, and social gathering that you feel you NEED to go to! Saying NO is truly so empowering. Consider your own needs, wants, goals and projected outcome before saying yes to anything!! Does this advice all mean you are selfish? Because I know that’s what flashed through your head at some point. Guess what? When you start taking control of who uses you at the cost of your own identity, growth, and contentment, your world will start aligning. Trust me, I know. You will be more respected, calm, clear headed and actually make progress towards your goals. Make one commitment today that protects you, your time, and your sanity.